In order to test whether the features seen in the Buntsandstein cobbles could be produced by impact deformation in conglomerates, shock experiments at the Fraunhofer Institute for High-Speed Dynamics (Ernst-Mach-Institut) in Freiburg, Germany, were performed (Michael Hiltl). A single-stage powder gun was used to accelerate C45-steel projectiles of truncated-cone shape. 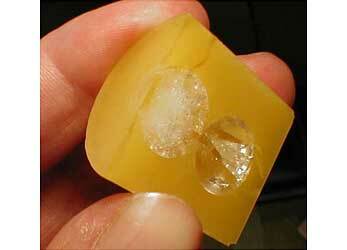 As targets, we used two quartz spheres (rock crystal, diameter 14 mm) in contact, embedded in a synthetic epoxy matrix. A recovered sample (shot 4) cut in half through the midpoints of the two quartz spheres. Five shots were performed with impact velocities in the range between 25 to 115 m/s, corresponding to initial impact pressures between 0.55 and 2.5 GPa. The recovered samples were cut in half through the midpoints of the two spheres, and thin sections were made in the plane of cut. From examination of the cuttings and thin sections we produced the drawings below, which show the most significant features of Shot 1 and Shot 4. Shot 1 (36 m/s; 0.8 GPa) resulted in loss of the upper part of the projectile-impacted target sphere. The lower half of the sphere is characterized by two sets of roughly perpendicular fractures. The first-formed fracture set is oriented parallel to the impact trajectory, whereas the open fractures of the second-formed set developed perpendicular to the impact. A narrow, sharply defined zone of heavy deformation exists in the axis of the upper sphere, where planar fractures (cleavage) and microbrecciation down to submicroscopic size occur. The lower sphere experienced lesser deformation. 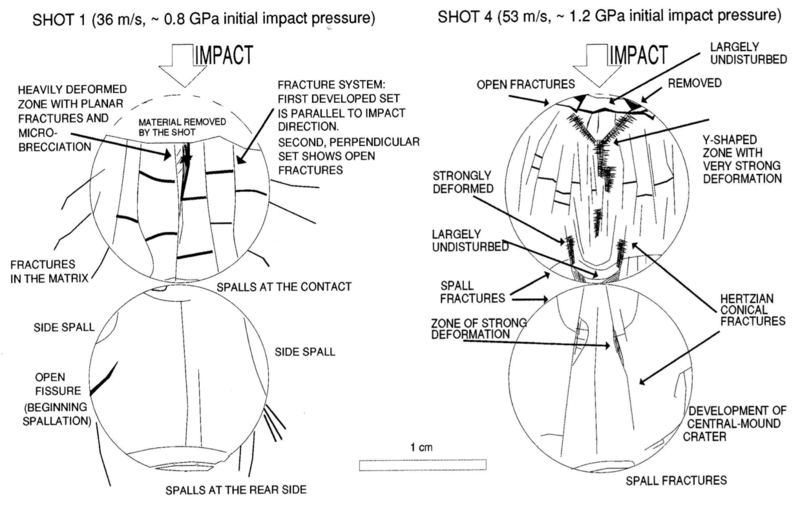 However, the single impact resulted in at least five spalls distributed over the surface of the sphere not directly impacted by the projectile. The spheres recovered from Shot 4 (53 m/s; 1.2 GPa) are nearly fully preserved within their matrix, although their interiors are heavily damaged. Surprisingly, the directly impacted zone is largely undisturbed. A truncated, cone-shaped body was formed by detachment from the sphere along an open spall fracture, and is surrounded by a ring-shaped loss of material. A similar pattern can be observed at the contact with the lower sphere. 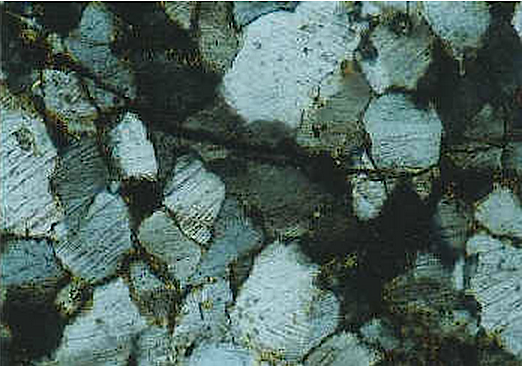 Local extreme damage appears in the interior, including funnel-shaped (Y-shaped in 2-D) zones where the quartz shows microbrecciation with strongly reduced refractive index, multiple sets of planar fractures (cleavage), mosaicism, and small patches (about 100-µm size) of isotropization (diaplectic quartz). In a few cases, there are faint traces of PDF formation. Moreover, a general fracture pattern (as discussed for Shot 1) has developed. Shot 2 probably reveals best how the various central-mound craters on the surfaces of the quartzite cobbles were formed. Fig. 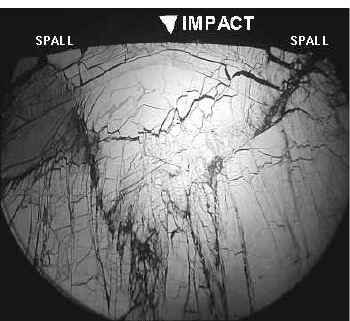 3. shows the photomicrograph of the directly impacted quartz sphere at an impact velocity of about 34 m/s corresponding with an impact pressure of about 0.8 GPa (= 8 kbar). In Fig. 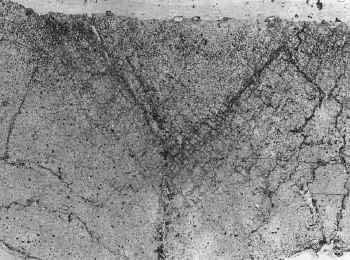 4. those fractures have been delineated that are marking the Hertzian fracture cone and fractures leading to central-mound cratering. More can be read in the chapter on Surface features. Fig. 3. Photomicrograph of impacted quartz sphere (shot 2; crossed nicols; the field is 7 mm wide). Note the complex fracture pattern including Hertzian cone fracturing, tensile spallation fractures, and various cracks roughly parallel and perpendicular to the impact direction. 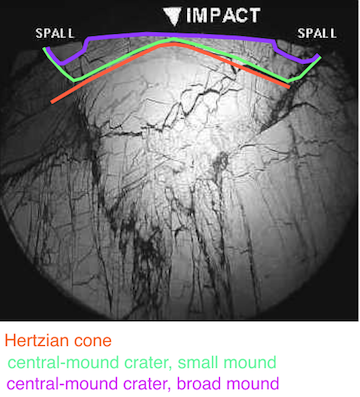 Also note the largely undisturbed zone immediately below the impact point in the quartz sphere reminding of the central-mound morphology of the cobble craters. Fig. 4. The photomicrograph from Fig. 3 where fracture pattern have been delineated to explain the formation of the central-mound craters on the surfaces of the shocked quartzite cobbles and boulders in the Buntsandstein conglomerates. Obviously, depending on various impact and target conditions differently shaped craters may occur. Fig. 5. Once more the photomicrograph of the experimentally impacted quartz sphere, shot 2 (crossed nicols; the field is 7 mm wide), for comparison with a naturally impacted quartzite cobble (Fig. 6). Fig. 6.Photomicrograph of a naturally impacted Buntsandstein quartzite cobble (plane parallel light; the field is 15 mm wide). Note the similar fracture pattern when comparing it with that of Fig. 5, especially the funnel-shaped (Y-shaped in 2-D) zones of strong defomations. The stress-strain condition of this peculiar fracture pattern is unsettled so far but is suggested to result from complex shock interaction in spherically formed bodies. Very probably, such a spotty shock concentration would have enabled the conspicuous intense formation of planar deformation features (PDFs, photo) in the quartzite cobbles far apart from the Azuara and Rubielos de la Cérida impacts (see more discussion in the chapter on Looking into the cobbles).